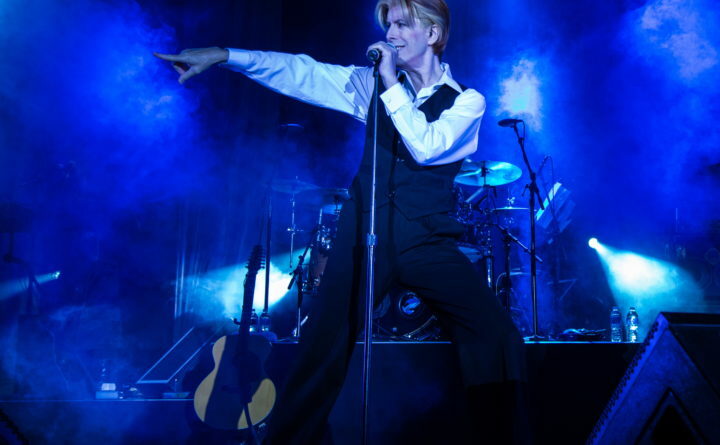 David Bowie impersonator David Brighton will perform with the Bangor Symphony Orchestra on March 9. When Ron Conterio first joined the Bangor Symphony Orchestra as a violin player back in 1975, his first season with the orchestra included a pops concert at the Bangor Auditorium. The featured performer? Pianist and comedian Victor Borge. The pops concert set for this weekend features the music of art rock icon David Bowie — a bit of a change from Victor Borge, or Rodgers & Hammerstein, or any of the other types of pops concerts the BSO would play back in the 1970s and earlier. The chameleon-like Bowie, who jumped from genre to genre and image to image throughout his career, incorporated orchestral elements into a number of his songs. Much of his fourth studio album, 1971’s “Hunky Dory,” is backed by guitarist Mick Ronson’s string arrangements, while his Berlin trilogy (the late 70s albums “Low,” “Heroes” and “Lodger”) was adapted into three symphonies by composer Philip Glass. His final album, “Blackstar,” released just two days before his death in 2016, features Bowie’s own string arrangements on the title song. “Our pops concerts are a chance for us to try something new, and also bring new audiences into our concerts,” BSO executive director Brian Hinrichs said. Since 2003, it has presented Kingfield Pops in western Maine each summer, with an array of New England-based folk, pop and rock musicians featured each year. Aside from a handful of concerts featuring showtunes or patriotic music, however, there was a solid 20-year span starting in 1990 when the BSO did not present very many pops concerts in its home base of the Bangor area. That changed in 2010, when the BSO played a Beatles-themed concert on the Bangor Waterfront with a touring tribute act. Each year since, it’s done the same, presenting everything from the music of the likes of Queen, Elton John and Billy Joel, to 2017’s well-received concert of works by legendary film composer John Williams. Fellow violinist Gloria Vollmers has a history playing pops music — before moving to the Bangor area in the 1990s, she played in orchestras for the likes of Johnny Mathis and Bob Hope, and played in session ensembles recording for commercials. She says musicians should not be fooled by the recognizability of some of the pops concert music that is often played by orchestras — it’s far more complex and nuanced than it might sound on the surface. Tickets for Saturday’s concert, which will be conducted by guest conductor Jeffrey Patterson, are available online at www.bangorsymphony.org/show/bowie.